You are here: Home / Giving Back / Set of Six Thank You Cards for Business or Personal Use – Win Them! 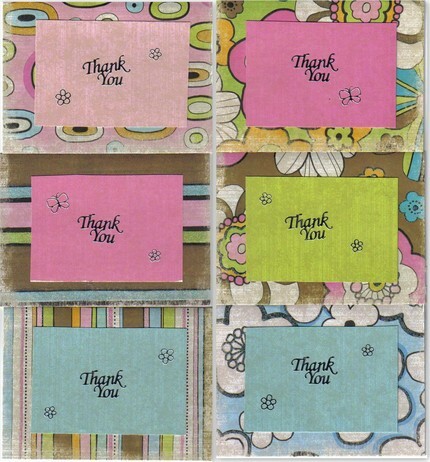 Set of Six Thank You Cards for Business or Personal Use – Win Them! A set of handmade Thank You cards for your business or friends: contemporary papers with a little grungy effect. You can see more from Cool Stuff for Sale here. 1. Leave a comment on this post for one entry. 2. Everybody over 13 years old, residing anywhere in the world is eligible to win. 3. All five contests (one each day this week) will be closed Friday at midnight. 4. Winners will be chosen at random, and posted on this post Saturday morning. Tweet this draw, or tell 5 friends about it. Leave another comment to let me know you did this = another entry. Subscribe to the Newsletter(see form in footer) & leave another comment = one more entry. Subscribe to the site’s feed here & leave a comment = one more entry. You have won this set of Cards! I have given the shop owner your email address and she will contact you for your shipping details. Energize (& secure) your blog with the latest, shortest, strongest news each week. A portion of every purchase goes to under privileged women entrepreneurs through the microloan organization, Kiva and World Vision. Other donations go to Canada Red Cross and annually we have the privilege of selecting two charities to receive free services.